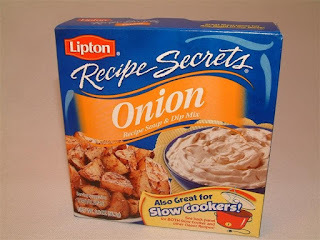 Today while shopping at Brookshires I was pleasantly surprised to find a good deal on Lipton Recipe Secrets Onion Soup Mix. It was on sale for .88 a box, which isn't bad on it's own. But I had .75/2 coupons, making two boxes come out to .50 1/2 each. Pretty good! I just wish I'd had a lot more of those coupons. Anyway, this stuff is great. Admittedly, all I usually do with it is make dip with it and sour cream, and use it on my pot roast. But I'm sure they're are a lot more things it can be used for. Do you have a yummy recipe that uses this stuff? If so, I'd love to hear about it! I love this stuff too! It makes great tasting meatloaf and burgers!